On December 15th 2015 my Arts Council England Research & Development grant arrived in my Bank Account, and the first reflection day of the project took place, in my kitchen. The whole year will include singing, making fans, dancing, recording sounds, filmmaking, photography and performance. Throughout the year the artists will meet up to reflect on the theme and the projects, and I decided to build these around the different modes of making. So, on December 15th, we gathered to make bread and talk about Gratitude. The we was Ellie (choreographer) Anna, (Sculptor), Jamie (musician) Chuck (Film–maker) and Mike (Baker). My dog and my son wandered in at various points. I noticed that the first thing I had had to do was ask Mike to bring semolina flour, which I hadn’t been able to find, and to send out a general email asking people to bring big bowls, as I didn’t have enough. So the whole project began with this little mechanism of asking and receiving and saying thanks. 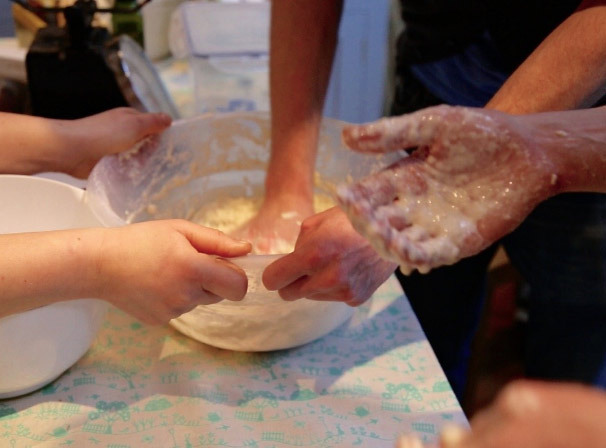 What struck with me were all the moments of collaboration in the bread making. Anna held the bowl for Mike when he got very active, we helped each other scrape dough off our hands, we took turns to speak and to listen. We sat and had tea and chocolate biscuits while it rose. And at the end we dived into the bread, with big lumps of butter. We all took home loaves of ciabatta, except Chuck, who forgot hers, so she is owed one! The Social Psychology research I’ve been reading tells me that gratitude makes you feel positive about the benefit you receive and the benefactor. So you know you are getting something but your appreciation extends to the giver. What I like in here is that you are focused on the gratification of your own need, but you are also ‘other oriented’. For me the research is to help me to see if this is what is going on between participants in participatory arts work, but of course it also needs to go on between the artists too, and between us and the participants, or why do we all need to be there?